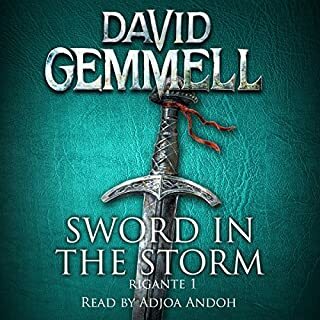 Always been a big fan of Gemmel and was excited to see the Rigante series on Audible. However, I very nearly did not get this book because of the reviews of the narrator, which would have been too bad. 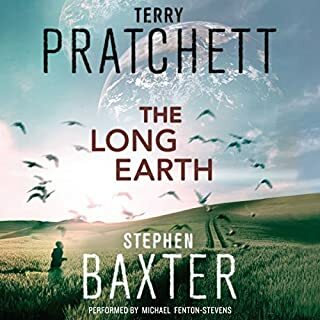 Admittedly, it took me a bit to get used to hearing a woman narrator of the many male characters, mostly because I am all too used to listening to men narrating books. I also realized that I have never had a problem with the numerous men narrators voicing female characters, often very badly, in so many books (what does that say about me, right!). 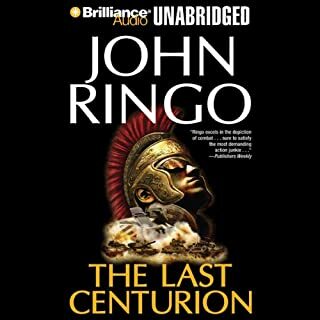 I have to say that this narrator was far better at men's voices than most male narrators of women's voices. 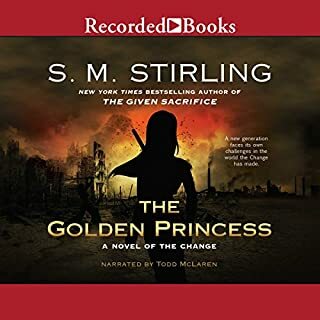 After about the first 30 minutes, I fell into her narration, she did a great job, mixing voices and accents quite well and I easily got lost into the rhythm of her narration and felt the book to be better for her skill. I am glad that I got this book and will look forward to Adjoa Andoh's narration over the series. 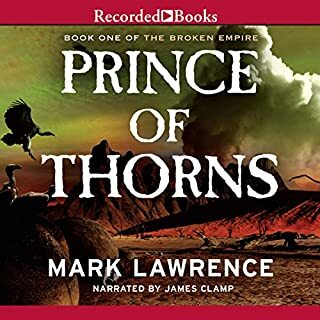 What was most disappointing about Mark Lawrence’s story? What character would you cut from Prince of Thorns? Would you recommend The Golden Princess to your friends? Why or why not? This book felt like a the author was killing time until the story can begin. The books in this series have seemed to slow down, like the author took a couple books worth of story and is spreading out over 10. What would have made The Coming of the Horseclans better? Would you be willing to try another book from Robert Adams? Why or why not? What character would you cut from The Coming of the Horseclans? 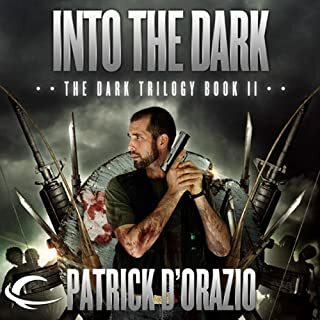 Where does Into the Dark rank among all the audiobooks you’ve listened to so far? What does Jim Cooper bring to the story that you wouldn’t experience if you just read the book? With her young son's potentially fatal neuroblastoma in complete remission, New York City medical examiner Laurie Montgomery returns to work, only to face the case of her career. The investigation into the death of CIA agent Kevin Markham is a professional challenge-and has Laurie's colleagues wondering if she still has what it takes after so much time away. Laurie and Jack race to connect the dots before they are consumed in a dangerous game of biotech espionage. What was most disappointing about Robin Cook’s story? The story line seemed to be a setup for a statement about medical research and business. I don't usually mind a little political bias in books, but there was far too many details that made a statement without contributing to the story. The epilogue was particularly transparent. I get these books because I enjoy medical thrillers, not to hear what the authors feelings are about patenting medical procedures and techniques, although I do agree with the statement, this wasn't the place I wanted to see it. I feel like there were several elements of the story that were left out to make room for the non-related details-The nanny was killed and that was it-the orphaned child that was to be Ben's responsibility, Danny, and several others were just left hanging. The narrators cadence was extremely distracting. 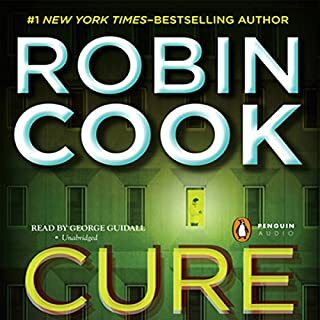 Could you see Cure being made into a movie or a TV series? Who should the stars be? It took so long to get to the meat of the story and I am still not sure what the point was. The characters were very well developed but, the story was a little thin. What aspect of Michael Fenton-Stevens’s performance would you have changed? The race is on to claim the area between the Ohio River and Tennessee. What's left of the resistance is hiding out in the tangle of central Kentucky hills - leaving the powerful, well-organized Kurian vampires the opportunity to fill the void. Major David Valentine knows there's only one way for them to find help before the Kurians settle in: a desperate dash by hijacked rail, followed by a harrowing river journey. Valentine unites friends old and new in the effort - but the Kurian Order won't easily yield. What did you love best about March in Country? I have read few series that allows a character to grow the way Val does in this series. The series moves Val through distinct stages of development as a man during a time of constant war. My favorite character is Val, but Val and Ahn-Kha have a great storyline that keeps me into the storyline. The relationship is about loyalty and friendship not unlike Frodo and Samwise, but more mature and cynical. 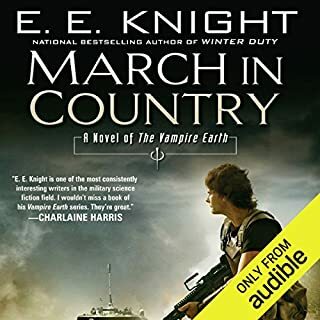 What does Christian Rummel and E. E. Knight (introduction) bring to the story that you wouldn’t experience if you just read the book? I don't usually write reviews for books, but I was so disappointed with this book that I had to write something. I got through about the first 3 hours, which was basically a rant about the evils of liberal ideals. It was written like a journal and had little to no story line. I have always enjoyed this authors books in the past and that makes this even more disappointing.